The steering system in your vehicle is a mechanism that enables the driver to guide and direct the vehicle in a chosen direction. Most car steering systems are made up of three or four components including the steering wheel, steering system, track and tie rods and the steering arms. These components can wear after years of use which will need to be repaired, or replaced. Some of the more common symptoms of steering problems include difficulty in turning the wheel, wheel vibrating at speed and loose steering. The suspension on your vehicle is the term given to the system of components, springs, shock absorbers and linkages that connect your vehicle to the road surface via the wheels and tyres. The suspension system serves the dual purpose of contributing to the car’s road holding, handling and braking for safety and driving pleasure; and keeping the occupants comfortable and isolated from road noise, bumps and vibrations. Symptoms of car suspension problems may include excessive bouncing and swaying, the car may not sit level and it may not handle well on the road. 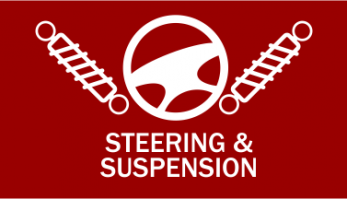 The symptoms of steering and suspension problems may be subtle and not become evident until you are in an emergency situation requiring quick manoeuvring to avoid a collision. You may not realise there is a problem until you need it most. At SRSC we fully understand the intricate network of cooperating components of both the steering and suspension systems. Our experienced team will test for any potential problems with systems and, with your confirmation, undertake any necessary repairs or, if required, component replacement. You can use this link to book your vehicle in for a steering or suspension inspection or alternatively call us on: 01773 260110 and one of our team will book your vehicle in.